USD/CAD is trading quietly to start the week, as the pair trades at 1.3565 in the European session. On the release front, there are just two US releases – Chicago PMI and Pending Home Sales. Canada will release Current Account and two Manufacturing inflation reports. On Tuesday, the US releases ISM Manufacturing PMI, while Canada will publish GDP, a monthly release. The Canadian Dollar enjoyed an excellent week, posting gains of close to 300 points against its US counterpart and improving to it highest level since early December. Oil prices have recovered somewhat, which has been good news for Canada, the world’s fifth largest oil producer. This has helped prop up the Canadian dollar, which has been hit hard by the collapse in oil prices which started in September 2015. The US posted strong Durable Goods data last week, and the Canadian dollar rose sharply, as stronger manufacturing activity in the US will likely translate into greater demand for Canadian raw materials. At the same time, Canadian fundamentals have not looked sharp in early 2016, and GDP for January is expected to dip to 0.1%. If GDP misses expectations, the loonie could quickly reverse directions and head to lower levels. It’s been a lukewarm start to 2016 for the US economy, which has seen growth and employment numbers soften in comparison with the red-hot numbers which characterized the second half of 2015. One sector which has been struggling is the manufacturing industry. The US economy has been grappling with a downturn in global demand, which has taken its toll on the export and manufacturing sectors. A strong US dollar, which has posted broad gains in recent months, has only exacerbated the situation. However, there was some positive news late in the week. US Preliminary GDP posted a strong gain of 1.0%, well above the Estimate of 0.4%. There was also positive news from the manufacturing sector, as durable goods sparkled. Core Durable Goods rose 1.8%, crushing the estimate of 0.2%. This marked the key indicator’s strongest showing since March 2014. Durable Goods Orders followed suit with a sharp rise of 4.9%, rebounding from the previous reading of -5.1%. This was stronger than the estimate of 3.0%. Meanwhile, housing numbers have not impressed, as New Home Sales slipped to 494 thousand in January, compared to 544 thousand a month earlier. This figure was well short of the estimate of 522 thousand. Pending Home Sales will be released later on Monday, with the markets expecting a gain of 0.6%. If this housing release also misses expectations, the US dollar could respond with losses. In the USD/CAD ratio, long positions retain a slight majority of positions (55%). 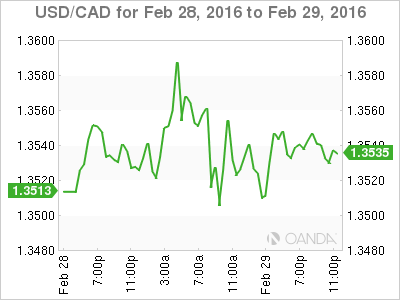 This points to trader bias towards the Canadian dollar resuming its upward movement.